On a late Sunday night in Erode – a city on the banks of River Kaveri, 400 kilometres from Chennai in Tamil Nadu – one of the community basketball courts is bursting at its seams. Even the rains pounding the roof of the court at the SDAT Basketball Stadium can do little to dampen the spirits of the spectators boisterously cheering the home-state team against defending champions Maharashtra in the men’s finals. The game – despite the final scores that do little justice to how hard it was fought – delivered on everything that the audience gathered to watch. For every foul called on the court there was a moment of incredible camaraderie between opposing players as they dodged and passed, dribbled and scored, crashed and toppled, and celebrated. 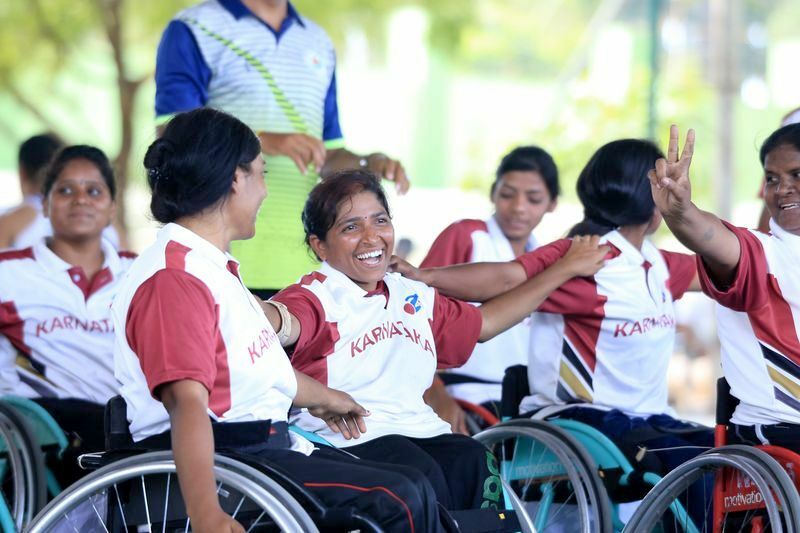 At every successful pass, the MCs reminded the “youngsters” to learn from the seasoned players as wheelchairs jostled for space along the sidelines – other teams eagerly watching their peers’ performance. One’s allegiances were open to scrutiny and unsolicited advice as the crowds rooted for their “favourites”. 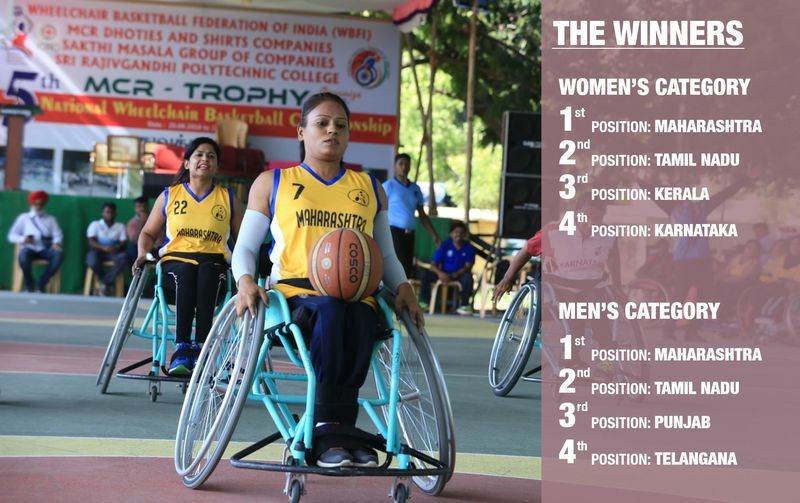 This year at the 5th National Wheelchair Basketball Championship, held 20-23 September, 336 athletes – 19 men’s teams and eight women’s teams – from across 19 states competed, enjoyed and popularised the sport. Goa, competing for the first time, even took their match against the Jammu & Kashmir team into two tie-breaks – a first in the national championship’s history. Also playing for the first time were Assam, Manipur, Gujarat and Madhya Pradesh. Both the men’s and women’s titles went to Maharashtra. But was it a victory just for them? Annpurna Mahant travelled 1800 kilometres to represent Chhattisgarh after only two days of training with one whole day just to get accustomed to the wheelchair – the sores on her palms testimony to the effort. “The first time I sat on the wheelchair I was so scared I would fall,” says Annpurna. For Chitrasen Sahu, a state wheelchair basketball player himself, coaching the Chhattisgarh women’s team to compete for the very first time was worth the effort. But he also recalls the anxieties of parents and the girls themselves who had never used a wheelchair. Getting the team together was a challenge and once that hurdle was crossed there were issues of inaccessibility – related to railway platforms and other spaces – which made it difficult to organise frequent training programmes. When the wheelchair basketball movement began in 2014 with five state teams, it would have been hard to believe that it would grow organically in the way it has. State associations advocated with their respective governments, corporate houses or their philanthropic wings to help raise funds to even purchase wheelchairs. Even now, people are contributing their own resources (time and money): from coaches and players taking time off from their job to players facing diverse barriers ranging from lack of accessibile accommodation, transportation and restrooms – all of which hinders them, particularly women players, from practicing or traveling for camps. The wheelchairs, too, are not on par with international standards due to lack of manufacturers of sports wheelchairs in India. 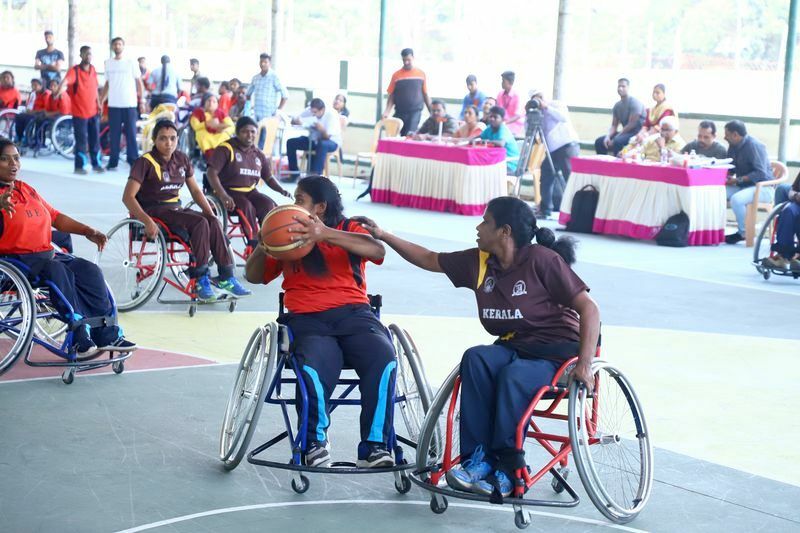 According to Oliver D’Souza, who is part of the Goa team, wheelchair basketball is very unique in that it has a point system which “incentivises every team to involve people with different levels of disability. So it’s very inclusive in that way. Wheelchair basketball has broadened our horizons socially and physically”. Chief Minister of Puducherry, V Narayanasamy in his special address sent out a clear message of “more respect” for persons with disabilities in society as they are “also citizens of this country”. Referring to the initiative as one that brings people from across the country together, providing players the opportunity to meet people from other states, he urged them to “carry back the message of the respect you got here during the tournament”. 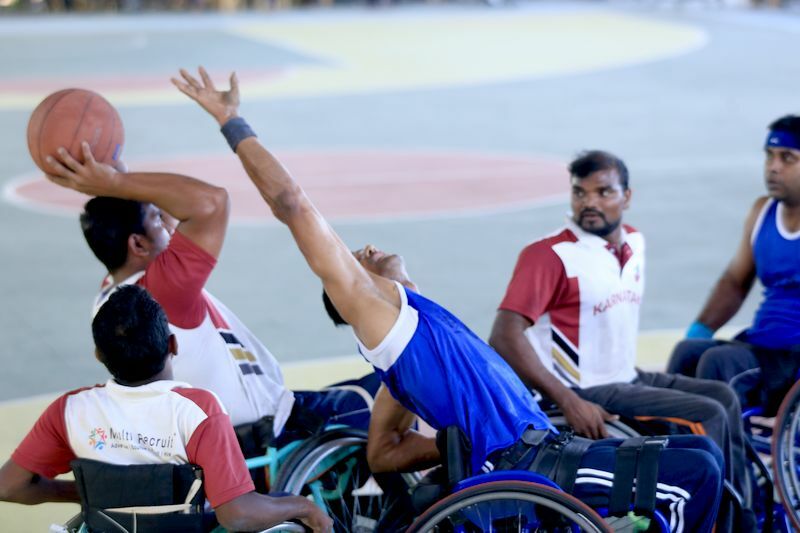 The journey back from the “Yellow City” – Erode is known for turmeric among many other things and now also for the National Wheelchair Basketball Championship – is flush with individual and collective stories of barriers, struggles, empathy and kinship. Making it even more special is the heart-warmingly proud in-flight announcement recognising the Delhi wheelchair basketball team on-board the flight. Inclusion, one thoughtful gesture at a time. We are very thankful to both ICRC and WBFI, who made it possible for persons with disabilities to take part in sports as they know the importance of sports for disabled people. Brilliant movement. Great work by WBFI and Deepali at ICRC. We remain committed to promote inclusion of persons with disability through sports.